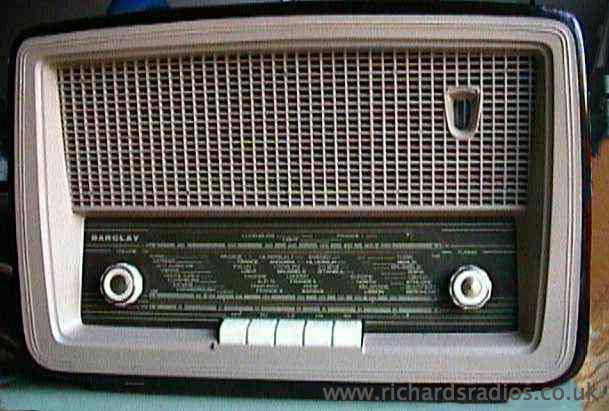 I have had this radio for 0ver 20 years and have switched it on only very rarely. I have been intrigued to know more about it. 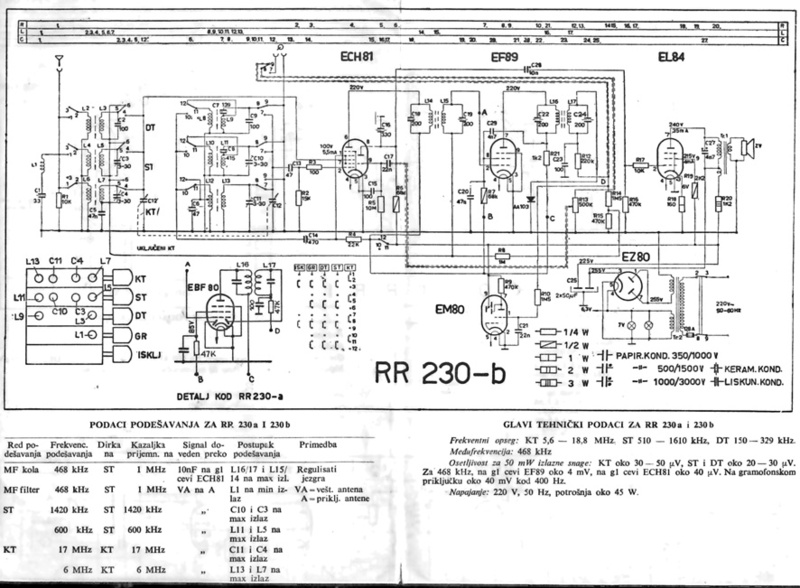 Recently I received a schematic of a similar radio (RR230) from Almir Agic, a collector of old ex-Yugoslavian radios from Bosnia and Herzegovina. This has led me to remove the chassis from the case and investigate further, but its date of manufacture is still a puzzle. The 50+50 MFd electrolytic is date stamped 5-49 so I guess it was probably made in 1949, however the dial indicates something else! "MV Caroline" is on the dial at about 200m and "Droitwitch" at about 270m. Radio Caroline came on air in May 1964 on 199m medium wave. 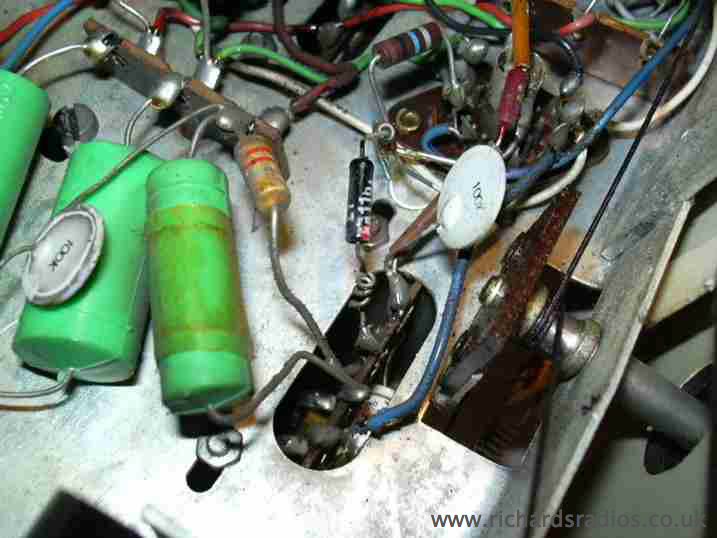 As you can see the inside of the cabinet is stamped 114-66, so maybe it was made in 1966, but why then does it have Long, Medium and Short wave but no VHF band as most sets of this period would have done? You will note that it has a ferrite rod aerial which to me suggests it was made after 1953. 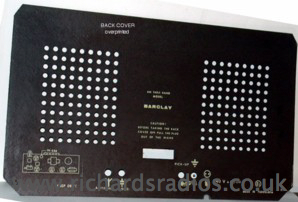 Sean Brady has a Barclay radio set, with the words 'MV Caroline' clearly marked on the Medium Wave dial at 199 Metres.He acquired this radio set at an auction room in Oldcastle, Co. Meath, Ireland (where he resides) in May 1991 for the sum of � 9.00 (Irish Pounds) and, ever since, has been trying - rather unsuccessfully - to find out more about it. When he stumbled across this web site, he could not believe his luck. 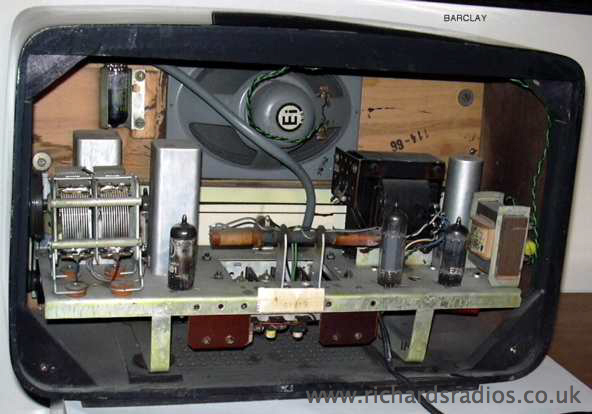 He says he would never part with this radio set because of the Radio Caroline connection as he has been a long term fan of this offshore radio giant. This set uses Noval (9 pin) based valves ECH81 ECH81 EL84 EM80 and EZ80, though some valves with this base were made as early as 1949 (the Brimar catalogue of this year only lists 5). As far as I know it is not until about 1954 that sets using only Noval valves were made. Almir suggests this model is similar to other models which were made about 1962 ( like Lotos ). It is very possible that some parts made 1949 are in this set since Yugoslavia was crisis at that time. He also suggests that are some old reserves of the RR230 radio may have been exported to UK where they were restored for UK market. This set is working, though the magic eye is not functioning correctly. On opening up the set the label shown on the left fell off the mains transformer revealing who it was made by and where! Although the label indicates that the transformer has a 200V primary there is another small typewritten label indicating that it is a 240V transformer. 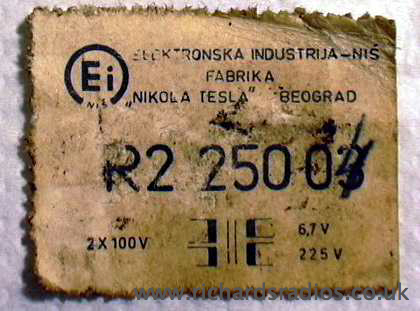 Elektronska Industrija (EI) were founded in 1951, the company being set up jointly with Telefunken. In 1959 EI started to manufacture valves under license from Philips, but they were not a subsidiary. Apparently part of the factory still manufactures valves using Philips designs. Here is a general view of the underside of the chassis, remarkably clean after so long. 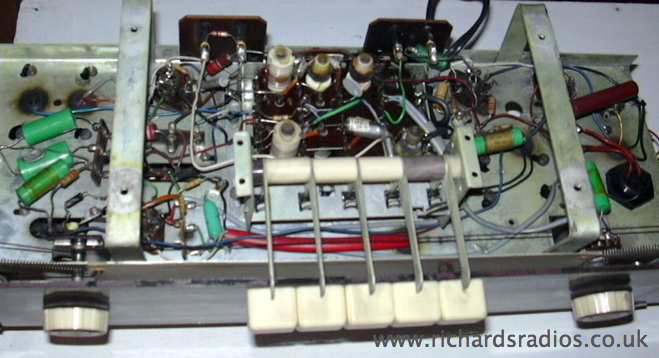 A closer view showing the area around the second IF transformer is shown below.